Organic, non-GMO, gluten free, soy free, and vegan. 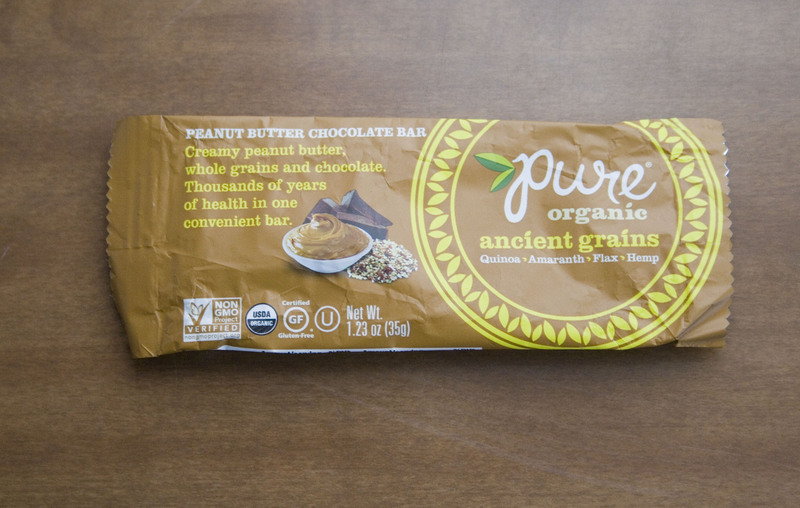 As awesome as the Chocolate Brownie bar was, is about as disappointing as this Peanut Butter Chocolate Bar tasted. I had pretty high hopes for Pure Bar after that protein-dense brownie bar rocked my world to its very core. While the taste and mouth-feel of the last bar were spot-on perfect for being a delicious brownie with some nutrients hidden away in the mix, this bar had a mouth-feel that reminded me of a dry granola bar that they tried to jazz up with some bits of chocolate. The one major selling point to this bar is that it is physically the lightest weight/smallest bar I have reviewed. I’m not actually sure if that even is a selling point, since it is not the most nutrient dense (not by a long shot) meaning you’d be better off eating a piece of an Organic Food Bar or a 22 Days bar rather than ever trying this disappointment. That being said, the small size of this bar manages to give it a protein-density greater than the Pure Bar Chocolate Brownie, the Kit’s Organic Bar, and all of the Simple Squares. The carb-to-protein ratio is also right in the ideal window. But, the price per gram of protein here is the worst out of every bar I have reviewed, making this the worst buy so far. This bar did have the lowest amount of sugar out of all the bars I have reviewed, making this ideal for anyone who is diabetic. Hey readers, I am back from the Black Rock Desert and my third trip out to Burning Man. Now I can speak from experience as to which protein bars actually held up best in the intense desert heat (which was significantly less intense than previous years). I’ll be trying to settle back into my groove of 1-2 of these a week now that life has gone back to relative normalcy. Organic, plant based, vegan, non-GMO, soy free, gluten free. Not made in gluten free facility. It was faintly coconut tasting, not as strong as I would have liked but probably for the best since coconut can be one of those flavors where either you love it (like I do) or you hate it. The chocolate was definitely more of the central flavor in this bar and the overall flavor was quite pleasant. 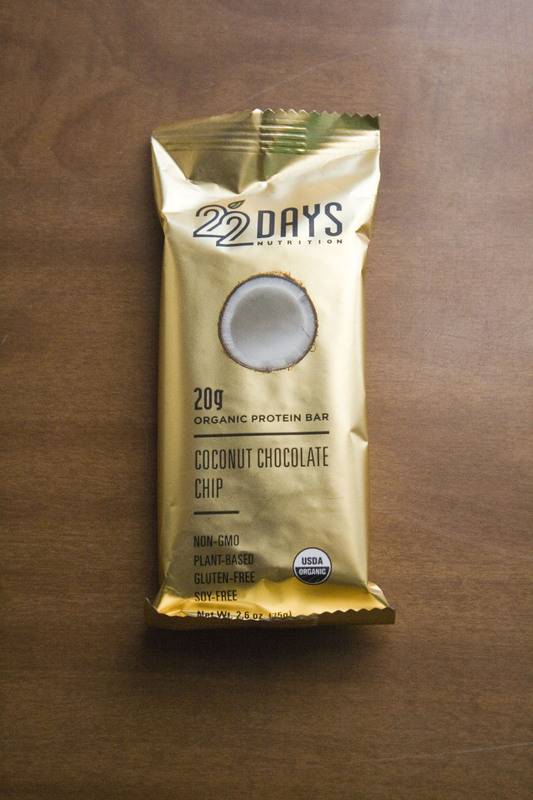 Like the other 22 Days bar I reviewed, the texture did remind me a bit of a power bar, really chewy but with a pleasant mouth feel. It did not have a shred of the dreaded chalky taste that typifies cheap protein; one of the major reasons I love this brand is they are entirely plant based without and cheap whey, wheat, or soy protein as fillers. The importance of this point cannot be overstated as most protein bars on the market are loaded with cheap filler proteins from China. Outside of the protein, there was a ton of iron, at 35% DV this would be the most iron-rich bar I have reviewed making it good for people who are iron deficient. This coconut protein bar manages to be even more nutrient dense than 22 Days peanut butter protein bar, not by much but by enough to be notable. As I made note of in my first review on 22 Days Daily Mocha Mantra, 22 Days has some organic protein bars that pack 20 grams of protein into each bar. While they are a bit heftier than other bars by about half an ounce they still pack in more protein per ounce than anything else I have reviewed, even more than the Squarebar. These 22 Days bars still have the cheapest protein per gram cost at 15 cents a gram and the best density of any bar reviewed; at this point I doubt I will find anything better. While I did not bring any of this flavor with me to Burning Man, I did bring three other 22 Days bars and they all held up well (save for my walnut protein bar where it seemed that the factory seal didn’t hold in the heat, the bar still tasted great but it was kind of stale).